These neoprene Swim Gloves are fully glued and blindstitched and have a comfortable 3D cut to provide the perfect hand position in the swim. As well as an extra long sleeve to provide maximum protection from the cold. Pair with your wetsuit for extra warmth, as well as providing non-slip protection when you're first walking into the water. Thickness: 2mm. Pair with your wetsuit for extra warmth, as well as providing non-slip protection when you're first walking into the water. Thickness: 3mm. The Zone3 Neoprene Swim Gloves are primarily designed for enhancing your protection against the cold. The gloves are unique in design to other brands, with an extended sleeve to minimise slipping and reduce water intake when tucked under your wetsuit. These are the perfect addition for an open water swimmer in cold environments. The Zone3 Neoprene Swim Socks are primarily designed for enhancing thermal protection. The Zone3 design also incorporates an extended design, with a Velcro strap to minimize slipping and water intake. These are the perfect addition for open water swimmers in cold environments. Thickness: 2mm. The Orca Neoprene Calf Guards give you extra buoyancy in the lower legs and avoid the need for a pull buoy which you then have to carry around for the run. Another advantage of wearing these calf guards over a pull buoy is that you're still able to kick in the swim, whilst also providing extra protection for your legs when clambering over rocks and running through undergrowth. Using a combination of 2 and 3mm 100% Neoprene, our Thermal Neoprene Swim Cap can be paired with your wetsuit for extra warmth in colder than usual waters. An adjustable chin piece provides a better fit and the increased warmth offered by covering your head allows you to stay in the water for longer. FOGGLE is unique - it is the only anti-fog towelette that actually cleans the lens while defogging. Tested and approved by numerous athletes, FOGGLE is perfect for swim, snowboard and ski goggles, as well as scuba masks and will leave you with crystal clear vision! Simply wipe FOGGLE onto your dry lens then let dry. Results are crystal clear lens that will not fog up. Keeping the wipe air tight will allow 6-8 applications. Better than hand paddles and legal in races, use the De Soto Neoprene Swim Sleeves as a training device in the pool to increase buoyancy and surface area of your arms, to create a more efficient torso rotation. The new Blueseventy Thermal Swim socks improve on the regular Neoprene Swim Socks through the addition of a metal cell liner, which stops water absorption and increases warmth. Comes in 2 sizes: Small and Large. When swimming in open water, safety is paramount. The Hi-Vis Neoprene Swim Cap features a bright color and bold stripes that provide you with extremely high visibility, helping you stand out and be spotted more easily in all water conditions. Meanwhile, 3mm Yamamoto neoprene rubber construction retains body heat for added warmth.and insulation. Blueseventy has improved their popular Neoprene Swim Glove by dropping the webbing for a natural feel of the water and added a metal cell liner that stops water absorption and maximizes warmth. A longer length cuff prevents water entry and increases warmth at the wrists. The Thermal Skull Cap takes the popular Neoprene Cap to the next level. A hollowed wool liner helps reduce water absorption which creates an extra boundary layer to protect against heat loss. For those swims in truly chilly temperatures stay warm in blueseventy. Superb multi-sport glove. Exceptional comfort, fit and dexterity. These 2mm neoprene swim sleeves allow for full range of motion in the shoulder area during cold water swims, while creating buoyancy. 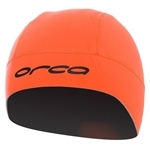 The Neoprene Swim Cap is designed for open water swimming and triathlon use. Showcasing enhanced construction for performance in the water, the TYR Neoprene Swim Cap 3mm Yamamoto neoprene rubber construction for insulation and ear protection. The Neoprene Swim Socks are high-ankle compression socks, designed to reduce water entry while swimming. Engineered with external seams to provide maximum comfort and reduced abrasion, the Swim Socks provide insulation and protection for open water and triathlon swimming. made out of 100% Neoprene (1.5 mm). Comes in two sizes: Small and Large. This swim cap is made of 3 mm stretchy neoprene rubber so there is no need for Velcro straps. The thin profile chinstrap maximizes comfort, while minimizing chafing and breathing obstruction. This cap will add more than 5 degrees (F) of warmth and water temperature comfort. One size fits all. RSS thermal swim cap was designed with comfort and speed in mind. Coated with super composit skin, super light and flexible neoprene and JY-stretch fabrice. Velcro adjustment below the chin. Cold weather training is necessary to prepare for those early morning starts. 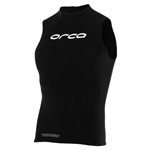 In addition to triathlon wetsuits, neoprene swim caps, swim socks and swim gloves will help retain body heat and make for a comfortable swim.